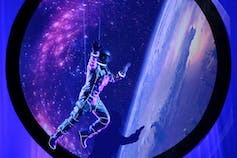 The Outer Space Treaty (OST) is the framework multilateral treaty that establishes the principal rules regulating the exploration and use of outer space. Established in 1967, it celebrates its 50th anniversary this year. But now we need an update. While the fundamental principles set out in the treaty are vitally important to the peaceful and orderly use of outer space, the pace of development of space-related technology – which allows for activities far beyond the contemplation of those that put the treaty together – means that some activities in space may fall between the cracks. For 50 years, the OST has largely allowed for a consideration of the interests of both the space “powers” and the space “have-nots”. This is an inspiring moment in the history of the human race. 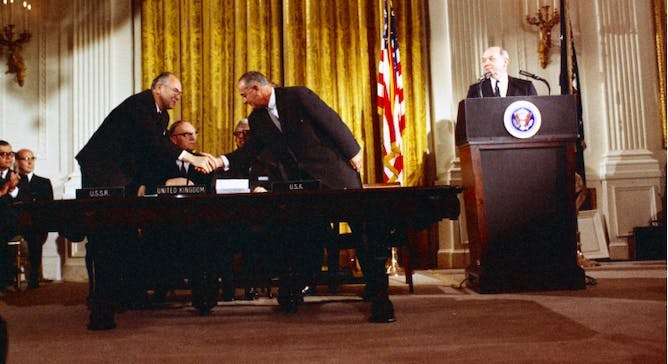 President Lyndon B. Johnson and USSR Ambassador Anatoly Dobrynin shaking hands at the signing ceremony for the Outer Space Treaty, January 27, 1967. Indeed, the treaty has (thus far) successfully created an environment that has prevented warfare in space. Its binding provisions are not only legally defensible, but have also historically reinforced an overwhelming political dynamic to refrain from overt military action in space. The treaty is, however, expressed in broad statements of principle; such as, that the exploration and use of outer space “shall be the province of all mankind” – or “humanity” in more gender-enlightened times. This was necessary in the geopolitical context. Broad statements of principle were sufficient to regulate relations between space-faring states in the first several decades of space exploration and use, while allowing some flexibility to those same states. However, as space has become more accessible and commercialised, those broad statements of principle are, in our view, still necessary but no longer sufficient. They need to be supplemented – but not replaced. At a time of heightened global strategic tensions, relative insularity and increasingly diverse vested interests, the prospect of new, legally-binding instruments seems remote, at least in the short term. Even the common mistrust that united space powers in the negotiation of the OST in 1967, is today fractured by uncertainty about the promises, prevalence and purposes of great powers and their allies. This is particularly the case with respect to an impending sense among some observers – which we do not necessarily accept – of the “inevitability” of armed conflict in space. So, where could we find the mandate to champion the cause of new legal instruments to supplement the broad principles of the OST? To adapt global space governance to the needs of the next 50 years? It is future generations who have the strongest claim to preserve and even improve the benefits from the peaceful exploration and use of outer space over the coming decades. They have at least a moral – and, arguably, legal – mandate to insist that states seriously consider supplementing the OST. And the opportunity for the next generation to state their claim is right here, right now. IAC 2016 was held in Guadalajara, Mexico. The site for IAC 2017 is Adelaide, Australia. In late September 2017, Adelaide will host the largest space-related meeting on the annual calendar – the 68th International Astronautical Congress (IAC). In more recent years, there has been a companion conference just prior to the IAC – the Space Generation Congress (SGC). This was initiated on the request of states through the United Nations Committee on the Peaceful Uses of Outer Space to represent the interests of the next generation in outer space. At the SGC, a group of young Australians will lead a working group of delegates from across the globe, to develop and propose a set of supplementary protocols to the OST, in order to adapt global space governance to the needs of the next 50 years. Crafting instruments that address the current and foreseeable future challenges in global space governance will not be easy. The challenges are not just big, they’re existential. Stephen Hawking recently suggested that humanity must become an inter-planetary species to escape climate change on this planet, which threatens to make the Earth environment increasingly incompatible with human existence. Climate change is not the only threat – an asteroid impact could wipe out our species, and one of the regular solar events in the life of our Sun could severely disrupt satellites and terrestrial networks and electronics. We can’t control that, although we could do something about human-generated space debris, which may make valuable Earth orbits unusable for millennia to come. But who should be responsible for space debris and how? What laws should apply to humans living on another planet? Who has legal authority to take timely action to divert an asteroid on behalf of the whole planet? Furthermore, if states continue to develop means of space warfare, in addition to the many pre-existing means of warfare on Earth, we might still be the authors of our own demise. But how do you regulate “space weapons” without undermining “the great prospects opening up before mankind as a result of man’s entry into outer space” (the opening words of the OST)? The global space industry is already worth over US$330 billion and generates hundreds of thousands of jobs. Even in Australia, a 2015 report commissioned by the Government estimated that the space industry here generated $3 billion to $4 billion in revenue. Possible future commercial mining of the Moon and asteroids potentially involves trillions of dollars. Furthermore, space is becoming democratised – accessible to all – through small satellite and small launcher technology. Can we find ways to share the benefits of outer space, as well as the responsibility for preserving it? The working group at the SGC face a difficult task in articulating new rules to supplement the broad principles set out in the OST. However, they represent important stakeholders who, more than any state, have a moral mandate to champion changes to adapt the OST to the needs of the next 50 years. We wish them great success.